I had some pav buns which was about to expire.Actually i bought them to try vada pav but i couldn’t make it as i was busy in trying some Gokulashtami recipes.This evening Raksha was asking some snacks to munch and then i realised about these pav buns.I was not in a mood to make pav bhaji or vada pav.So i quickly browsed some easy pav bun recipes and found this in Sanjeev Kapoor’s video. It was very simple and found it yummy with spices & masalas.I tried immediately & it was a big hit with my daughter.I too loved it a lot.Its a very easy,simple and quick snacks recipe which can be made in minutes.Even bachelors can try this as it has no grinding job.In the actual recipe Cucumber,tomatoes were used & it was titled as jain masala pav sandwich without onions.But i used onion & boiled potato slices as i din’t have cucumber in hand.So the choice is urs.It tastes yummy however its made.Do try this easy sandwich recipe for your kids evening snacks.I am sure,they will enjoy it.Not just kids,we parents can also have one & enjoy . 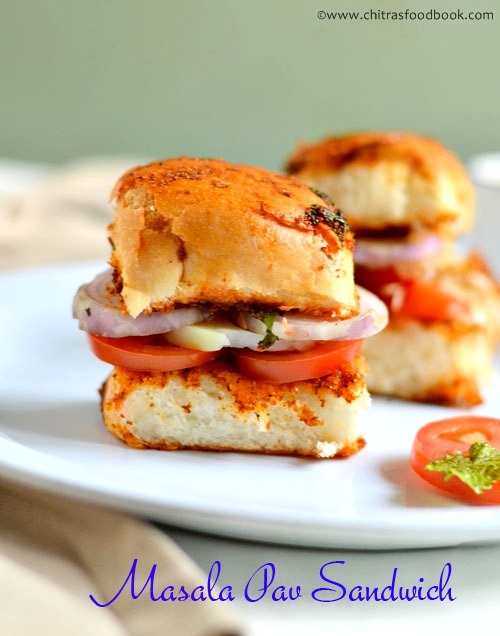 Easy masala pav sandwich recipe - Quick n yummy sandwich recipe !! Make the masala by mixing all the spices.Add water & make it little thin.Add little lemon juice if needed. 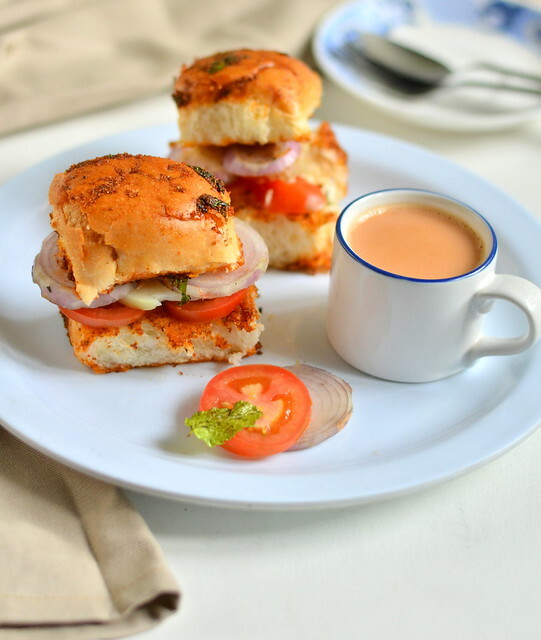 Now slice onions,tomatoes & boiled potatoes.Slit open the pav buns vertically like an open book till half way. Heat dosa pan.Add 2 tsp of butter or ghee. Keep the flame low and spread the butter all over the pan.Now add 2 tsp of mixed masala and saute for few seconds in low flame.Do not increase the flame.It will make the masala burn.Now add some finely chopped coriander+Mint leaves.Mix well. Open the pav and place it over the tawa.Quickly move the pav all over the tawa for the masala to coat well on both sides. Remove the pav and arrange the onion slices in one side & tomato slices in the other side.Keep the boiled potato slice in the middle and close the pav.Serve hot immediately. For no onion no garlic version (Jain) use cucumber slices instead of onions. U can also keep a slice of cheese for kids. My fav sandwich....... Looks tempting and tasty!! Very interesting and delicious sandwich, so tempting..
My mouth is just watering here, irresistible pav sandwich. omg such an irresistible sandwich, am drooling over here :) quick to make yet tempting one !! Loved your clicks.. pav sandwich sounds interesting and delicious. I loved ur recipe... I just made it and i loved every bite of it... !! Even the look of your sandwich is so very tempting! Will definitely try out! Thanks a lot..
Sure dear. Try n enjoy !